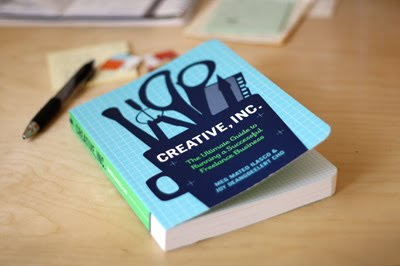 You might have seen this book floating around the internet lately: Creative, Inc. by Meg Mateo Ilasco and Joy Deangdeelert Cho. If you're thinking of freelancing in a creative field, I highly recommend it. When I transitioned a couple years ago from working full time at a design firm to working for myself, I read through several books on this topic. Most of them left me slightly panicky and overwhelmed with complex legal terms and business forms; not to mention many of the books were outdated. But this little volume offers clear, accessible advice and steps to follow. It's realistic: yes, you'll need thicker skin to deal with rejection. Yes, you'll put in lots of hours for what feels like little return (at first). But it's also inspiring. The interviews with successful freelancers are fascinating, and the useful information from Meg and Joy provides a road map to get you where you need to go. I wish I'd had this book earlier! Thanks! I'll pick it up this weekend. I need as much CLEAR information as I can get. Thank you! This is just what I needed as I've started giving serious thought to venturing into the design field on my own. Nervous, anxious and excited all at once! Do you think I should start freelancing? Thanks for the recommendation. I will definitely give this book a looksie. Cassie, no kick back. I once tried to set up some kind of affiliate thing with Amazon, but I don't think it worked since it showed zero people clicked the links over the course of five months or so. And with 10,000 blog readers a day, it seems that surely one person would have clicked something, right? :) Whatever. I second your recommendation, Jess! Thanks for the recommendation! I'm putting it on my list right now!! I've been looking to up my freelance business but have been wondering what to do next! Thanks for sharing! Hello! I'm french and I don't speak english very well. Excuse-me for mistakes! I enjoy your blog that I feel very nice, luminous and useful and creative! Thank you!! I totally agree about most other books being scary. So much legal-ese to get through - it makes you want to stay in your cube! ; ) I can't wait to check this one out! I haven't read this one but I read the previous one about running a craft business and have recommended it to anyone and everyone. Great books! thanks for the report! i'll check it out for sure!.. Thanks for the book review. I've looked at this several times and wondered if it'd be worth purchasing. Sounds like a great resource. Starting something knew (of any craft, trade, or business) can seem daunting. I am sure this will help many feel more informed. thanks for this post. i've been looking for a few books to read as i, too, consider leaving my design agency (which is a great place to work, but my heart longs to be at home with my family) to freelance from home. besides this book, is there anything else (reading in print or on the web) you'd recommend to someone thinking of taking the plunge to work for themselves? decided to purchase this today with your recommendation, along with their other book craft and the craft planning guide that they came out with. thanks for the recommendation! Thanks for the tip! I just bought this for my Kindle.